Coat of Arms of the City of Brussels, where a St. Michael, still valiantly conquering the devil was wreathed with the inscription “Bruxella Civitas Brabantiae”. 1986 was the turning point in the holding of this event, which, until then, had not been regular. 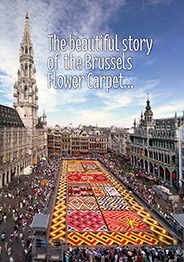 The “Tapis de Fleurs de Bruxelles” Association was then created at the initiative of City of Brussels in cooperation with the Province de Brabant and the “Les Franc-Bourgeois” (a central Brussels traders’ association). The new association laid down the regulations; the event was to be held every two years, for 3 to 4 days on the weekend of 15th August and could be enhanced by “Son et Lumière”, fireworks, a jazz concert and other traditional folk entertainments. The 1986 theme of the carpet was the “Coat of Arms of the City of Brussels” where a St. Michael, still valiantly conquering the devil, this time made from seeds and leaves, was wreathed with the inscription “Bruxella Civitas Brabantiae”.